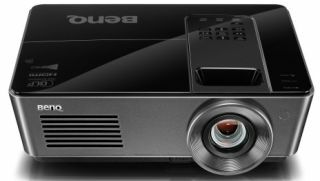 BenQ has announced additions to its S Series line of high-brightness professional projectors. Made specifically to meet the demands of medium- to large-sized classrooms, corporate meeting rooms, and auditoriums, the company's latest projectors provide up to 5,000 Colorific(tm) lumens to intensify projections in any professional installation environment. "As projection technology continues to evolve, we continue to offer professional systems integrators enhanced performance and increased flexibility in our high-brightness series," said Bob Wudeck, associate vice president, strategy and business development at BenQ. "Rounded with a number of benefits including Colorific image quality, ease of installation and maintenance, and lamp-saving technology, our new S Series projectors deliver the complete package to amaze audiences while providing important efficiencies for IT and AV managers." Comprising the SX912, SH915, and SW916 projectors, the professional S Series line casts up to 5,000 lumens of brightness and boasts 11,000:1 contrast ratios to bring BenQ's Colorific performance to large venues - delivering accurate, crisp, and long-lasting image quality via 1 billion colors. Eliminating both light burn and color degradation over extended usage and time, the devices reduce total cost of ownership (TCO) while providing XGA (SX912), WXGA (SW916), and native full HD 1080p resolutions (SH915) for an incomparable viewing experience. To bring greater simplicity to the installation and setup process, the S Series features a 1.5x big-zoom lens ratio, while the SW916 adds corner, surface fit, and 2D keystone capabilities. The SX912 projector offers LAN control, and both the SH915 and SW916 add display control. All models provide remote management and control, and multiple projectors can be centrally monitored for simplified maintenance across large facilities. Third-party integration with Crestron, RoomView, and PJLink further simplifies system interoperability. During operation, the projectors can easily display content via a built-in USB reader, as well as wirelessly (SH915 and SW916), allowing users to connect quickly using solid-state media storage drives or through the LAN to enable rapid content access without a PC connection. Featuring BenQ's world-leading SmartEco(tm) technology, the S Series projectors allow the automatic adjustment of lamp power based on the optimal amount of brightness that is required, enabling large venues to reduce their TCO while maintaining optimal contrast, brightest performance, and up to 3,800 hours of lamp life. To allow rapid rebooting whenever the devices are accidentally switched off, the projectors' Instant Restart capabilities allow presenters and operators to reactivate the units immediately, within 90 seconds, during which time power is maintained at 30 percent for further energy efficiencies and convenience. Providing the ultimate in connectivity, the S Series projectors are fully 3D PC, Blu-ray, and nVidia 3DTV Play ready. The three models provide microphone inputs for more streamlined presentations in addition to an audio pass-through function that preserves lamp life by enabling only sound when no image is needed. Available now, BenQ's SX912 and SH915 retail at $2,999, while the SW916 carries an MSRP of $3,499.